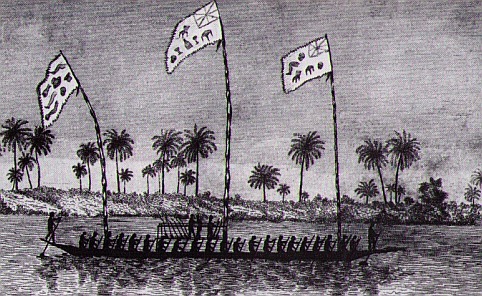 Igbo war canoe from Nigeria, circa 1830s, demonstrates a blend of indigenous and imported technology. Construction is of a single log. Steering is provided by two oars-men in bow and stern. Muskets stand ready on the fighting platform in the center, and captured enemy flags and trophies fly overhead. Swivel guns and small cannon were sometimes installed. Guns manufactured in Europe had been important trade items on the coast of West Africa since the seventeenth century, when they had been exchanged for slaves as part of the infamous ‘triangular trade’ with the West Indies. Native powers such as Ashanti and Dahomey adopted them with enthusiasm, and by the middle of the nineteenth century they were spreading to other areas of the continent. By then the trade was assuming huge proportions: according to the explorer Richard Burton, in the early 1860s a single company was importing 13,000 guns a year through East African ports alone. By way of trade among the Africans themselves, guns had infiltrated into the heart of the continent even before the first explorers arrived. In 1862 John Hanning Speke, the first European to explore the shores of Lake Victoria, found that the people living there were already familiar with flintlock muskets brought by Arab traders, and when Stanley sailed down the Congo in 1876, the first clue that he was approaching the Atlantic and ‘civilization’ came when the Bangala opened fire on him with muskets instead of the spears and arrows which he had encountered so far. All these weapons were smoothbore muzzle-loaders of the type which had equipped the armies of Europe during the Napoleonic Wars. Many of them were army surplus pieces which may well have seen service at Waterloo, though others were manufactured specifically for the African market. But by the 1870s, just at the time when Europeans were beginning to contemplate the military conquest of large areas of the continent, it was realized with some alarm that more modern weapons were also getting into the hands of Africans. The second half of the nineteenth century saw an unprecedented revolution in small arms technology. Before 1850 European armies still relied on the single-shot, smoothbore muzzle-loading muskets which had served them for 300 years. After 1900 the latest development, the magazine-fed repeating rifle, remained in front-line service for another half-century. But between those two dates the armies of the industrially developed powers adopted and discarded with bewildering speed a succession of improved weapons, each of which promised a decisive advantage over those it replaced. First came the muzzle-loading rifle of the 1850s, not much quicker to load and fire than the old smoothbores, but far more accurate at long range. Rifles such as this – the French Minié, British Enfield and American Springfield, for example – equipped most of the combatants in the Crimea and the American Civil War. Faster-firing breech-loaders had already begun to make an impact in the latter conflict, but it was not until the late 1860s that they became the standard infantry weapon of most major powers. Typical of the first generation of breech-loaders were the British Snider and the American ‘trapdoor’ Springfield. These were both conversions of older muzzle-loading rifles, but by the 1870s purpose-built breech-loaders were appearing, of which the best known was the Martini-Henry. As the term ‘breech-loader’ suggests, they were loaded not through the muzzle but by opening and closing a breech at the rear of the barrel. Not only did this do away with the laborious process of ramming powder, bullet and wadding down the muzzle, so increasing the rate of fire, but it was now possible for a soldier to reload from a prone position without exposing himself unnecessarily to enemy fire. He could also load and fire more easily while advancing. It was the breech-loader which gave the regular soldier the first decisive advantage over a traditionally armed African opponent with spear and shield, because he could now shoot so much quicker – perhaps ten rounds a minute compared to the musket’s two. But each round still had to be extracted from its container and loaded individually, and even faster rates of fire could be achieved by fitting the rifle with a magazine containing five or more rounds, each of which could be fitted into the breech by operating a bolt or lever. The American Civil War had also seen the debut of early repeaters like the Henry, and the famous seventeen-shot Winchester followed soon afterwards, but these weapons were not widely adopted by European armies, even though explorers were using them in Africa as early as the 1870s. Stanley preferred the Winchester over his heavy and slow-firing hunting rifles for ‘defensive’ purposes, and took one on his famous expedition in search of Livingstone in 1871. However, they were not always reliable, and the early models used low-power cartridges which gave poor long-range performance. It was also believed – with some reason – that ever faster-firing guns would lead to the demand for impossible quantities of ammunition. But in 1886 the French introduced the Lebel, the first of the bolt-action service rifles which most infantrymen carried through two world wars. The British equivalent, the Lee-Metford, was in service early in the 1890s. At the same time two more innovations were introduced. The traditional gunpowder or ‘black powder’ gave way to new smokeless versions, which avoided the clouds of white smoke which used to give away a rifleman’s position, and also gave the bullet greater velocity and hence better range and accuracy. Simultaneously, and partly as a result, the heavy old-fashioned lead slugs were replaced by smaller calibre bullets – typically .303in. or 7.9mm, compared with .450in. or 11mm for single-shot breech-loaders. These were lighter and a soldier could carry more of them, largely avoiding the supply problem. Magazine rifles were capable of even more rapid fire than the single-shot breech-loaders – by 1914 the British regulars were achieving the staggering rate of thirty rounds a minute – but their impact on African warfare was less decisive than might have been expected. If an opponent was obliging enough to charge a firing line in the open, as the Dervishes did at Omdurman in 1898, they would be slaughtered, but Sniders and Martini-Henrys were usually more than adequate in such circumstances. In small-scale ‘bush warfare’, where the main threat came from ambushes launched from cover at close range, many observers felt that the new smaller rounds lacked the power to knock a man down quickly enough to stop him getting to close quarters. And the concealment afforded by smokeless powder was less useful against an enemy who did not return fire, but attempted to charge to contact with cold steel. Each stage in this progression saw European and American armies discard hundreds of thousands of obsolete weapons, many of which found their way to Africa. In 1871 Stanley had found the Arabs of Tabora already in possession of ‘German and French double barrels, some English Enfields, and American Springfields’, as well as obsolete muzzle-loading flintlocks (Stanley, 1872). Already by this date military and exploring expeditions were arming their local recruits with Sniders and similar breech-loaders; these men often kept their weapons after they were discharged, and it was not long before traders were buying them up and selling them in the interior. In 1884 the imperial pioneer Harry Johnston visited a chief on Mount Kilimanjaro who maintained a force of 400 warriors, half of whom were armed with Sniders. In other cases weapons were deliberately sold by European merchants in areas where their governments hoped to make trouble for a rival power. The Zulus obtained many of their guns from the Portuguese in Mozambique. Others acquired them by defeating invaders in battle. In the Sudan in 1875, for example, the Bari massacred an Egyptian patrol and captured thirty-three Sniders and Remingtons. The presence of even this small number of guns in the hands of a hostile tribe caused the Egyptians considerable alarm, although it turned out that the Bari could not make use of them because they had not captured any cartridges. In 1888 the British consul general at Zanzibar reported to London on the implications of this influx of breech-loaders, which were replacing the ‘cheap and worthless’ old trade muskets. Unless checked, he concluded, this meant that ‘the development and pacification of this great continent will have to be carried out in the face of an enormous population, the majority of whom will probably be armed with first-class breech-loading rifles’ (Beachey). So in the Brussels Treaty of 1890 the European powers agreed to ban imports of all rifles and percussion smoothbores into Africa between 20 degrees north and 22 south. This agreement has been regarded by some historians as a major factor in the suppression of African resistance, but in practice it had little effect on the lucrative gun-running business. Arab caravans transported firearms smuggled in via the east coast as far north as the Sudan, and were the main means by which King Kabarega of Bunyoro kept his armies supplied in his wars against the British. Officials in German East Africa happily sold guns to the warring factions in British Uganda, as did Charles Stokes, a renegade lay employee of the Church Missionary Society. The Ethiopians re-equipped much of their army with breech-loaders captured from the Egyptians or supplied by France, Italy and Russia, while Samori Touré, who led the Mandinka of West Africa in their wars against the French in the 1880s and 1890s, is said to have sent spies to work in French arsenals in Senegal, then set up his own workshops to manufacture rifles and ammunition, with considerable success. Altogether around a million guns – most of them breech-loaders – were sold in Africa between 1885 and 1902 alone, but on the whole the consul’s fears proved unfounded. There were occasions, however, when his prediction seemed all too plausible. Many African warriors proved to be poor marksmen, but some armies did win firefights even against European-trained troops, especially when they had the benefit of cover. The Mahdist victory over Hicks Pasha in 1883 was partly due to the accurate shooting of the ‘Jihadiyya’ defectors from the Egyptian army (though later on the marksmanship of the Mahdist armies seems to have deteriorated). At Adowa in 1896 the Ethiopian army overwhelmed the Italians with close-range fire from modern rifles, and in Angola in 1904 Kwamatvi riflemen firing from the cover of the bush massacred a Portuguese column which included cavalry and artillery, as well as infantry armed with bolt-action rifles. But more often the standard of African musketry was abysmally low. Charles Gordon complained that even the trained Egyptian soldiers whom he led against the Bari in the Sudan in 1872 were ‘not a match for a native with spear and bow; the soldier cannot shoot, and is at the native’s mercy, if the native knew it’ (Hill). The missionary J H Weeks, writing with thirty years’ experience of the Congo, put it even more forcefully: ‘I have seen the native make war with both kinds of weapons, and I would prefer to fight twenty natives with guns than two armed with spears.’ The reasons for this failure to make the most of the new weapons were complex. Many of the cheaply manufactured ‘trade guns’ were of very poor quality, and customers unfamiliar with guns were often deliberately cheated. In the 1830s the South African traders supplying muskets to the Zulu king Dingaan routinely removed some vital component, such as the spring which powered the flintlock mechanism, before delivering the guns. At first the Zulus did not realize that their new weapons were useless, though a newspaper article published in 1837 warned that Dingaan had ‘at last’ discovered the trick. It is likely that many similar deceptions went undetected, since one writer believed that guns were frequently purchased for display only, and that many of those to be seen in African villages had never been fired and never would be. Even those weapons which were theoretically functional were not always reliable in practice. In 1845 a writer in Birmingham had condemned the city’s gunsmiths for exporting ‘horribly dangerous’ weapons made of poor iron, and pointed out that while a good-quality musket cost sixteen shillings to make, ‘African guns’ were being sold at a profit for a third of that price (White). Later in the century cheap and inferior copies of more modern weapons were also manufactured specifically for the undiscerning African market, and by the 1890s, according to Hiram Maxim, a factory in Spain was even producing counterfeit Winchesters. Furthermore the gunpowder supplied for these guns, Weeks reported, ‘is generally adulterated, and is warranted to make more noise and smoke than do damage’. Not only were their weapons often inferior, but African warriors seldom received proper training in the use of the sights, and shared the usual tendency of inexperienced shooters to fire too high. As Colonel J W Marshall reported after a battle in Sierra Leone in 1898: ‘A large number of rifles were used by the enemy, but the bullets whistled harmlessly overhead. A native can seldom use a rifle at short range, for he thinks the higher the sights are put up, the more powerfully does the rifle shoot.’ However, Samuel Baker, who led native troops in the Sudan, believed that their main problem was an inability to estimate range. Aiming high was in any case a perennial failing with shooters accustomed to the curving trajectories of spears and arrows, and was no doubt still necessary with the low muzzle velocities which poor-quality gunpowder produced. But when this habit was carried over to more modern cartridge weapons with a flatter trajectory, it must have made the tendency to fire over the enemy’s heads even worse. This entry was posted in Warriors by MSW. Bookmark the permalink.